Tender and beautiful is the queen of flowers - Rose, which aroma contributes the feelings of love and admiration. Behind the amazing scent and different colors, this unique blossom has numerous health benefits in its derived products - water and oil. In the beginning, the water is mainly used for cosmetic purposes, but today it is a medicinal tool applied to different traditional medical and mental practices. The reason is - it works simultaneously for the mind, body, and soul. In fact, it is a by-product of rose oil extraction. When the rose petals are distilled for oil production, the liquid that left behind is the rose flower aqua, which also is named hydrosol. Today the biggest manufacturers of brand rose water are in Bulgaria, France, Italy, etc. Thanks to several beneficial components - flavonoids, glycosides, terpenes, anthocyanins, and vitamins - A, C, E, B, rose water is a magical liquid which can heal from allergy to high blood pressure, headaches, etc. It is not new that it can be applied externally and internally. Rose water is with fresh and purifying scent, which promotes the feeling of harmony and peace to our energetic body, that's why it is often used for emotional well-being and stress relief. Also, it is a powerful mood enhancer, which helps to get rid of anxiety, depression and accumulated daily stress. Effectively can eliminate sleep disorders, too. If you rub your head with a cotton swab of rose water before going to sleep, your brain will release all negative thoughts and forget about the stress. This will calm the nerves and all rose's components can improve your sleep and body health. 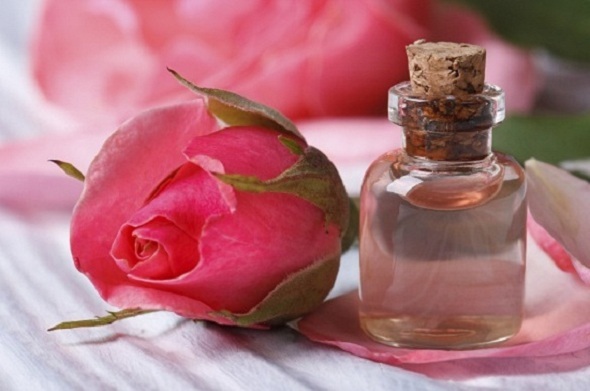 As a herbal solution, rose water is an excellent tool for skin and hair health and beauty. It has soothing, cooling, anti-inflammatory, antiseptic and astringent effect on the problematic and oily skin. If you apply regularly, it neutralizes the skin PH and makes it properly for every age and type of skin. Because of all its properties, it reduces acne, eczema, and dermatitis. The water of roses is a great cleanser and easily remove accumulated dirt, oil, and sebum from the skin. Also, it helps to hydrate, moisturize and revitalize the face skin and slow the aging process. Daily cleaning with this water protects the fine skin, minimizes the wrinkles and smooth old scars and wounds. It can reduce sunburn marks and smooths the complexion. Rose water is miraculous for hair condition, as well for treating the inflammations of scalp skin and dandruff. By strengthen every hair and increase the hair growth, this liquid is appropriate for men as for women. If you regularly massage your scalp, it will stimulate the new hair growth and minimize the baldness. As well, your hair will be cleaner and fixed all day because it is a natural conditioner. Furthermore, you can add 20-30 ml. to your shampoo, so to improve its quality. There is no other better soother for tired, red and fatigued eyes. That's why it is very good for those who work in front of the screens all day. After a long working day, squeeze one-two drops of rose water into each eye and the fatigue will disappear instantly. Rose water can be taken internally. It vastly improves the condition of teeth and gums, decreases unpleasant breath smell and reduces mouth inflammation and bleeding. If you replace your mouthwash with rose water this will relieve the sensitivity of your gums and teeth. As well gargling with rose water may have antiviral effect and heals a sore throat. By drinking rose water, you will cleanse gallbladder and liver systems, decrease bloating and other stomach problems. If you pour 20-30 drops in your water, tea or juice, it will not only make the taste of the drink more special and exotic but also will boost the antioxidant activity in your body. This will help to reduce the bad cholesterol, high blood pressure or sugar, balancing the hormones, etc. It is easy to prepare natural rose water at home, by soaking 30-40 dried rose petals in 250-300 ml. hot filtered or distilled water in a jar, or in the sun for two-three days. Take out the petals and keep the liquid in the refrigerator for a week. It is preferable to use only organic and natural products of rose aqua because only they are beneficial for our health. Let's trust to the water of roses, which can care for your body internally and externally, as only it can do for you.